With a convenient location, just minutes from Conway and North Myrtle Beach, H & H Homes has begun development on a brand new natural gas community called Astoria Park. Outside of city limits, off Highway 90 and close to highway 22, this beautiful slice of heaven will have less traffic, a tranquil ambiance, and lower property taxes. With 7 diverse home plans, you are sure to find the ideal plan for you, your family, and your lifestyle. The 2-story Colonial and single ranch-style homes offer 3 to 4 bedrooms in sizes from 1500 square feet to 2700 square feet. Incredible features like granite countertops, stainless steel appliances, coffered or trey ceilings, inside, and 2-car garages vinyl siding, and brick-veneer trim, outside, along with the H &H 10-year builder’s warranty make these homes a great buy at $200,000 to $300,000. Many of the homes offer tranquil scenic views of one of the neighborhoods 4 large ponds. Community students attend Waccamaw Elementary School, Black Water Middle School, and Carolina Forest High School. 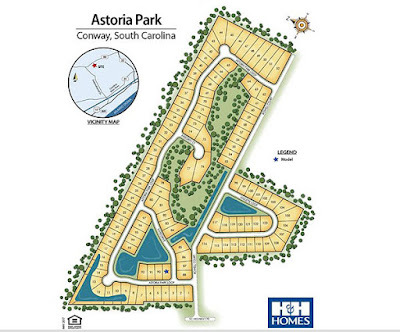 If you are thinking about building your dream house, you will want to see all this community has to offer. Please visit our website to learn more and call our real estate professionals with any questions you might have. To see all this wonderful new neighborhood has to offer, schedule a private tour of the new home for sale in Astoria Park. You’ll be glad you did.